Sometime in late 2001 or early 2002 my wife and I had purchased our first digital camera. For the times, it was a darn good ‘point and shoot’ 3 megapixel Olympus. The image quality was very nice and it was pretty simple to use. No more dozens of film rolls to be exposed and processed. Now I could shoot hundreds and thousands of images without any concern about running out of film or the expense. Nice. This first digital camera is also what drew me further into photography and allowed me to learn digital as I went along. I shot everything I found to be the least bit interesting, different or cool. Which to me was pretty much everything. 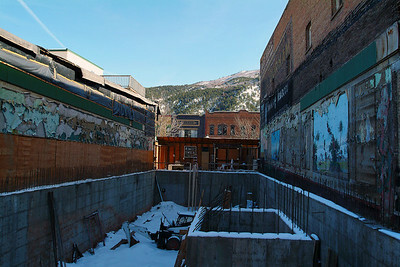 In November the Post Independent (Glenwood Springs, Colorado) carried an article about the demolition of the old Glen Theatre in downtown Glenwood Springs. After reading the article and viewing the few images that accompanied it, I had to shoot the location. This would be the first time the Post Independent inspired me to shoot a project. The second time would be the Colorado Yule Marble Quarry. The building that was the Glen had always been a movie theatre from the very beginning. It was built in 1907 and was called the Pastime Theatre, complete with the obligatory piano that was played along with the silent films of the era. Over the years the Pastime changed owners and names becoming the Isis, Orpheum and finally Glen Theatre. Once the theatre had been razed it was clear that there was no south wall to the structure and it had been built onto the Oddfellows Hall next door. Most of the remainder of the old Bull Durham tobacco mural could still be seen on the bricks of the hall. 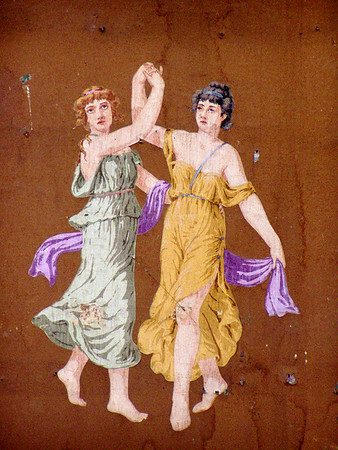 The murals on the inside walls of the theatre were probably installed in the early 20’s, right before ‘talkies’ were being introduced, as they were discovered behind the sound boards when they were removed from the walls. No one familiar with the Glen Theatre can remember ever seeing the murals or even knowing that they existed. Some of these murals would have been pretty risqué for the time! Some of the murals were simple scenes with an Asian flare that you certainly would not expect to find in a 1920's Western Colorado theatre. The murals were not painted onto the walls by hand, but look to have been installed via a wallpaper type process. Most likely these were pre-printed and pasted onto the interior as you can see in some of the images that a mural is pulling away from the old wall. 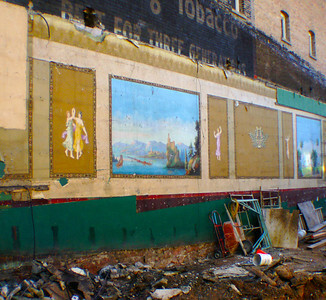 Once exposed to the elements during demolition, the murals fell apart and were then torn from the wall to be replaced with new construction. Pretty much all that remains of the murals are the images you will see in the gallery. I felt compelled to shoot these murals to preserve part of the hidden history that had been uncovered for just a short time before passing away for good. My only tool at the time was a simple 3 megapixel camera, most cell phones have more capability than that old camera did. The more we move forward the faster we go, that camera became obsolete within 4 months. Let’s hope we don’t discard our history and heritage as quickly as we do our technology. Thanks to The Post Independent, Carrie Click and the Frontier Historical Society.